Bacteria convert harmful nitrogen by-products from aquatic animals into less harmful nitrates. This process occurs naturally in nature's lakes and streams. In a Koi pond these bacteria are found on the walls of our ponds. They also can be found on the inside walls of the pond plumbing, attached to the skimmer basket, and on the rocks that form a waterfall. The reason it is important to consider what filter media to use when we build biological filter systems, is to increase the available surface area for these bacteria to colonize. Rock is an economical and the most common media used in pond filters. Because of rock's low cost and availability, it is a good material to use for a biological filter media. But rock or crushed gravel is not the only material that can be used as a filter media. Any fish-safe material that bacteria can attach to is suitable for a filter media. The important consideration is to keep the pollutants and unwanted debris out of our ponds, while keeping the beneficial bacteria in our systems. If you have any questions, or would like advice on which filter media is best suited to your task, please feel free to contact us for help. It is important to not only maintain clean pond water, but healthy pond water. 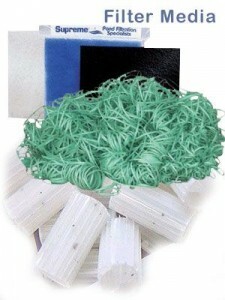 We can help you choose the right pond filter media for your Koi pond.